If you need an engaging motivational speaker for your professional association meeting, workplace wellness lecture series, or similar event, consider booking me for an Office Fitness Talk. All talks are backed by thorough scientific research and are delivered with passion and enthusiasm. For a glimpse of my presentation style, watch this five-minute Ignite Seattle talk on standing desks for a capacity crowd (about 800 people, all of whom stood for the talk) at Town Hall Seattle. 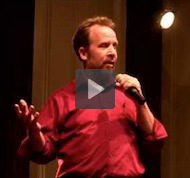 Or watch my presentation on “How (and Why) to Change Your Sitting Habit” at a lifehacking conference. By now, you’ve read the stories about the research on how deadly sitting is. The scariest finding: Sedentary work days take years off of your life, regardless of how fit you are or how much you exercise after work. These three areas – exercise, ergonomics, and posture – are the pillars of office fitness. Talk attendees leave with new fitness practices that they can start using right away (and with follow-on materials that they can refer back to). All talks are backed by extensive research and emphasize do-it-yourself and other low-budget implementations. Talks can be delivered as a 20- to 30-minute brown-bag-lunch talk, as a more formal 40- to 50-minute keynote presentation, or in a 2- to 6-hour workshop format. Multi-session series of talks, which can be customized to address your organization’s unique needs, are also available. To book a talk or to learn more, contact me at larry (at) larryswanson (dot) com or fill out my speaker request form. Larry Swanson is the author of Scared Sitless: The Office Fitness Book. He is also a certified personal trainer, licensed massage therapist, and long-time speaker and presenter. A 12-year career in book publishing wrecked his low back, which led to years of medical research and self-care, culminating in enrollment in massage school. Over an 18-year massage career in downtown Seattle, he has helped hundreds of office workers cope with the vagaries of desk work. Larry’s interest in office fitness originally arose from the pain patterns, posture issues, and ergonomic challenges he observed in those clients. When he discovered how deadly sedentary behavior is, he also became certified as a personal trainer to learn more about exercise and how to motivate people to move more. Larry has presented to thousands of people over the past 25 years, from small break-out sessions to large auditorium talks, from classroom trainings to conference education sessions. Book Larry for an Office Fitness Talk.